So here's another tiny country with a hugely impressive history that I'm sure I never learned about in school. 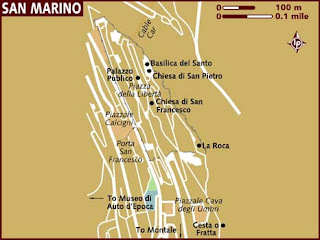 How can it be that the American educational system can short change generations of school children by not teaching them about countries like San Marino? I know for sure that the way history and geography are taught today is vastly different (and better) than the way I learned it: memorize, drill and forget. And I know I could have paid more attention - but still, as awesome a country as the USA is, we have a lot of work to do when it comes to understanding the world outside our borders. San Marino is a landlocked microstate that is completely surrounded by Italy. The country's land area is a mere 24 square miles (smaller than Martha's Vineyard), and is the third smallest, yet oldest country in Europe. With a population of roughly 30,000 (about twice the size of the small town I live in), San Marino is the oldest surviving sovereign state in the world and has the oldest constitution, which dates back to 1600. The country is said to have been founded in 301 AD by a Christian stonemason named Marinus the Dalmation who fled from anti-Christian sentiment and the Roman Emporer Dioceetian on the island of Albe. Finding refuge on San Marino, Marinus hid atop the peek of Mount Titano, an so founded an enclave for others who shared his Christian beliefs. According to the World Atlas, evidence of life in prehistoric times is likely, yet archiological proof on Mount Titano only dates back to the Middle Ages. Originally named the "Land of San Marino", then "The Community of San Marino", the country is now officially referred to as The Republic of San Marino. 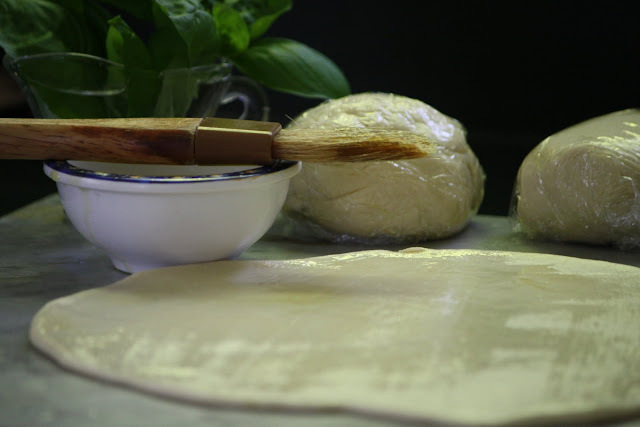 Cuisine in San Marino is quite similar to Italy's and its neighboring Emilia-Romagna and March regions. Mediterranean style cooking is not unusual to find, but the country also claims its own rich and unique dishes. White beans, bacon, chickpeas, garlic, rosemary, pasta, smoked ham, beef, a wide variety of cheese and tomato sauce, rabbit and fennel are but a few regional ingredients. Pastry, sweets, tortes and biscuits often use hazelnuts, chocolate, honey, dried fruits and nuts, but to name a few. 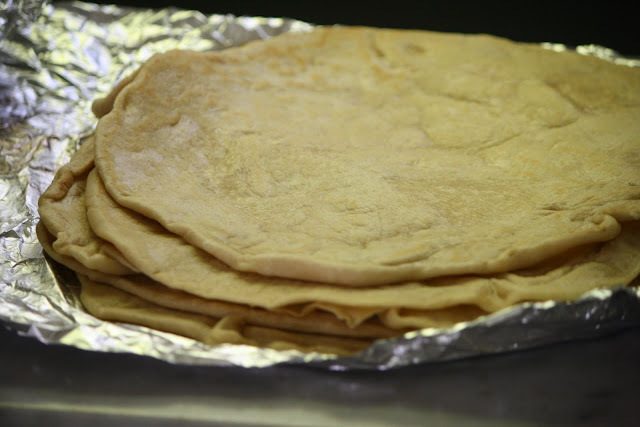 Piadina (also called Pieda or Piedina) has its roots in both San Marino and Emilia-Romagna and is typically sold by street vendors at small food stands, where the flat bread is grilled to order. 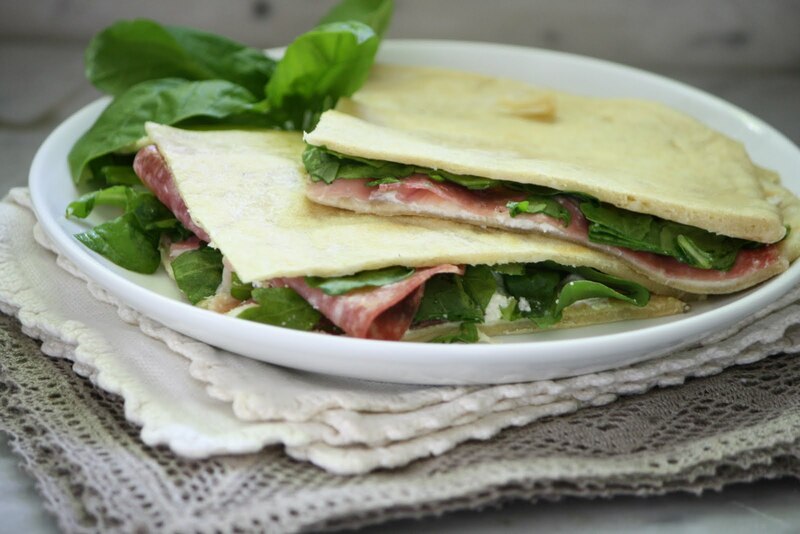 This simple fare is described as a cross between Greek Spanikopita and Middle Eastern Pita bread, except that it uses ricotta and/or mozzarella and escarole instead of spinach. 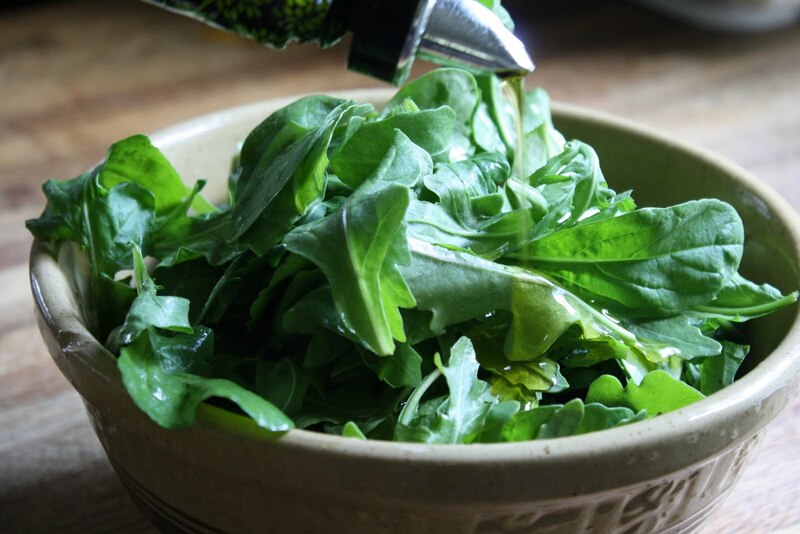 This is a slightly up-dated version that uses arugula, the lovely peppery green which just happens to be plentiful at farmer's markets this time of year. 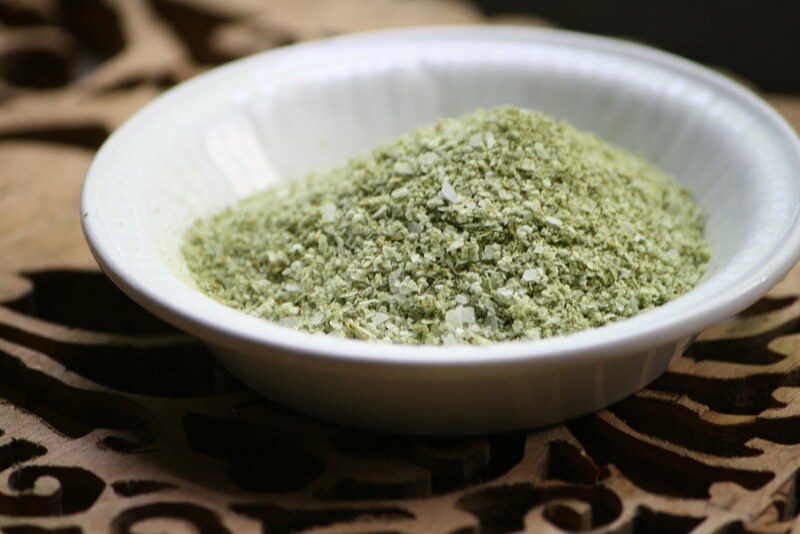 Finally, my brother gave me some arugula salt from Sofra Bakery - crazy, right? 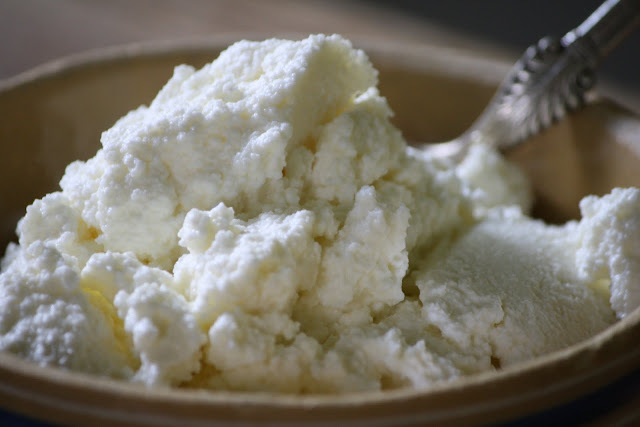 - which I used to season the Narragansett Creamery fresh ricotta (available at Whole Foods) - This ricotta is so good that I ate a few spoon fulls straight out of the container. 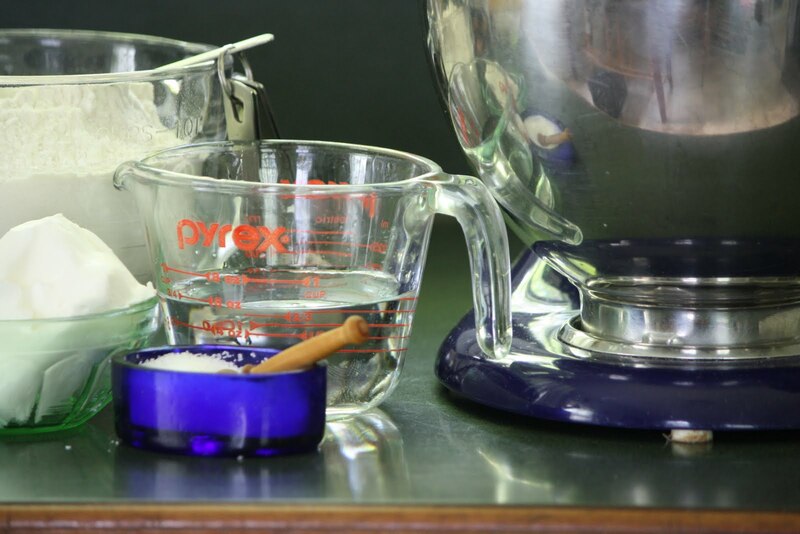 In a stand mixer fitted with the dough hook, combine the flour, baking soda and 2 tsp. of salt. 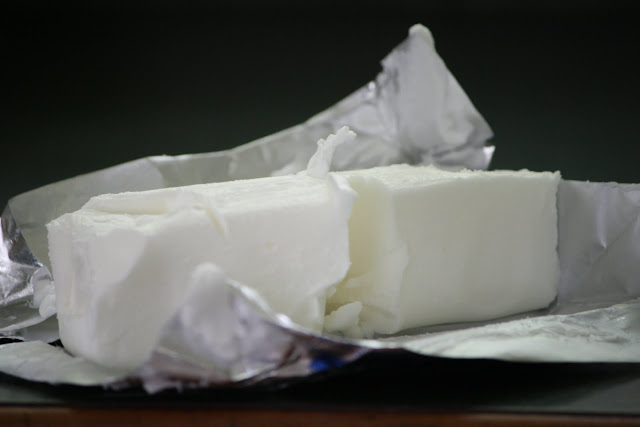 Add the lard and mix at medium-low speed until evenly combinged. Slowly add the water, mixing until the dough forms a mass around the hook. Increase the speed to medium and knead until smooth, 5 minutes. 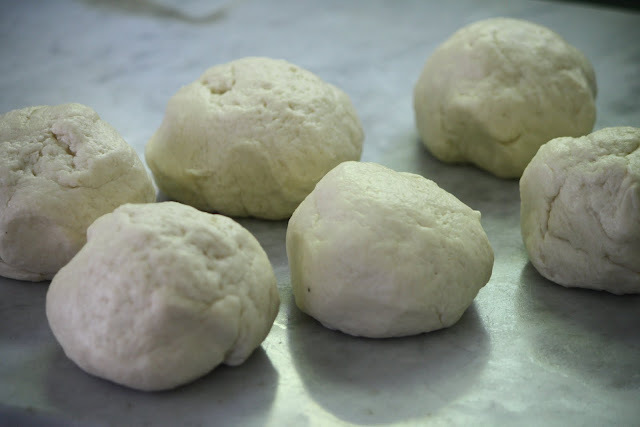 Divide the dough into 6 pieces and roll each piece into a ball. Wrap the balls in plastic and let rest at room temperature for 30 minutes. 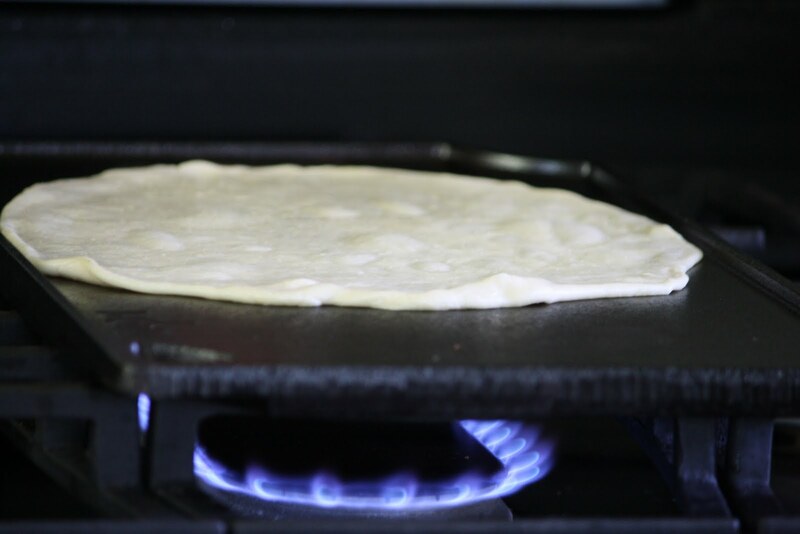 Preheat the oven to 225 F. Heat a cast iron griddle until very hot. On an unfloured work surface, roll out each ball to a 10-inch round, about 1/8-inch thick. Brush both sides of each round very lightly with oil and grill over moderate heat, turning once, until golden and cooked through, 3-4 minutes. 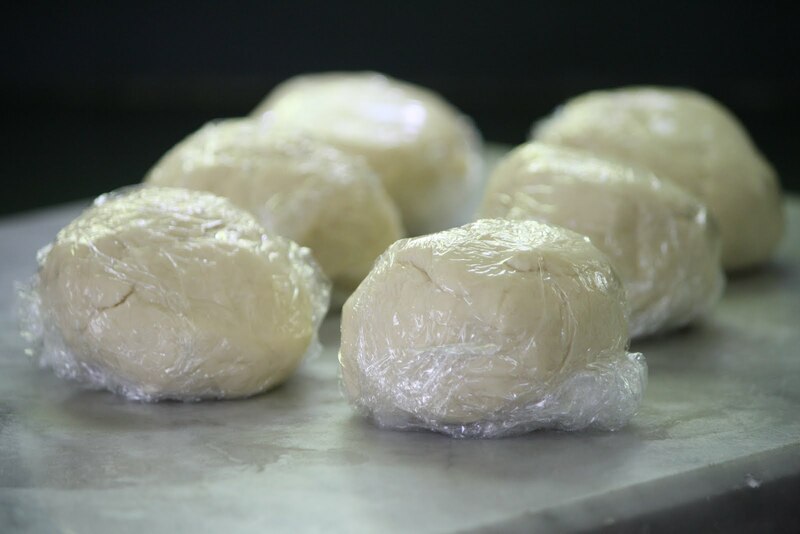 Wrap in foil and keep the breads warm in the oven while you cook the rest. In a small bowl, season the ricotta lightly with salt and pepper. In a medium bowl, toss the arugula with the 1 Tbsp. 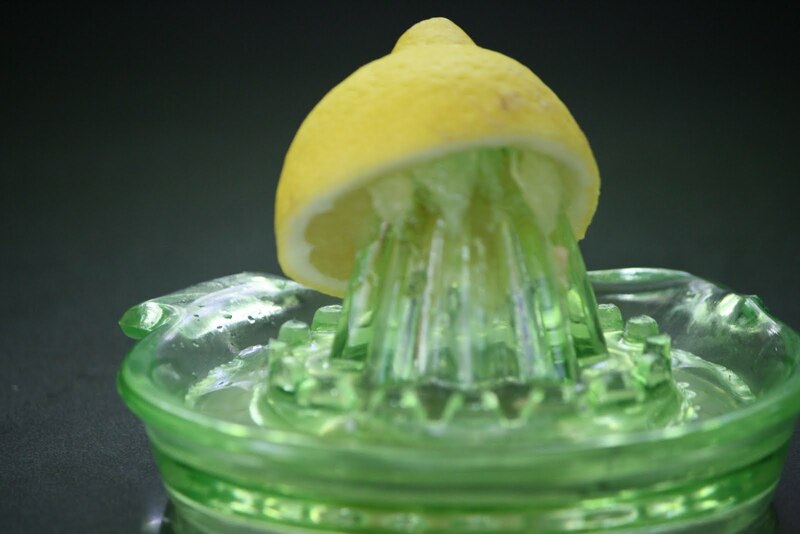 of oil and the lemon juice and season with salt and pepper. Arrange 3 breads on a work surface and spred with ricotta. 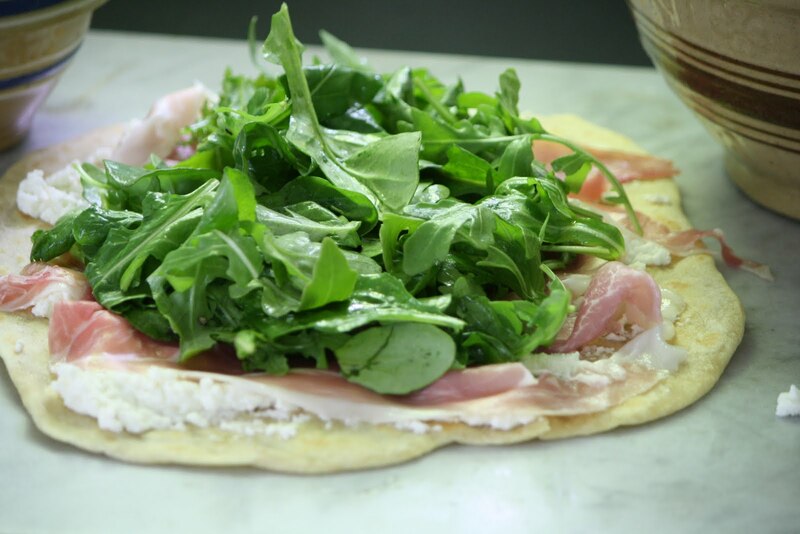 Top with prosciutto (or mortadella or salami), followed by the arugula salad. Cover with the remaining breads, cut into quarters and serve warm. Final Assessment: Have I mentioned how much I love Italian/Mediterranean cooking? This meal was easy to make and assemble and even easier to eat. The filling possibilities are endless. 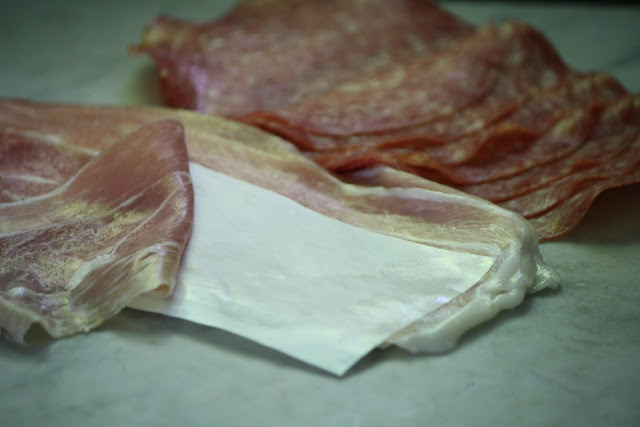 I made one with prosciutto, one with Genoa salami and one with both. 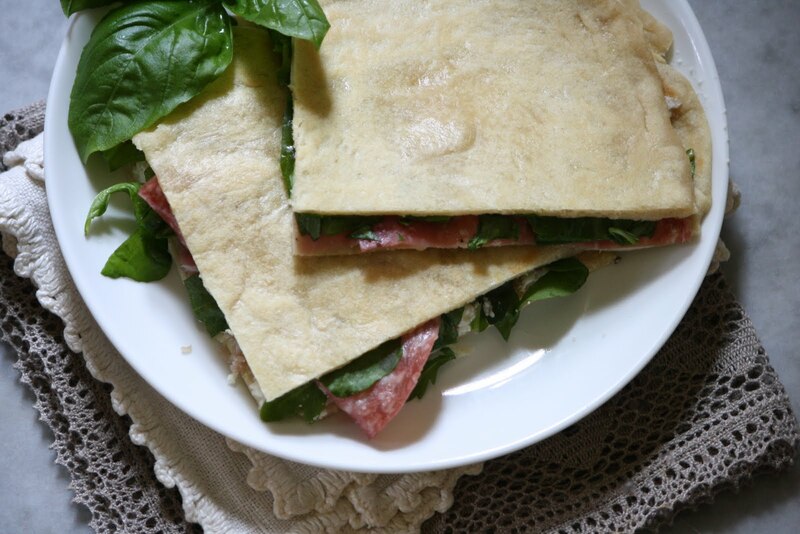 They would be just as good without meat as well...a few slices of ripe tomato, thin slices of fresh or smoked mozzarella a few basil leaves and presto, a delicious lunch, dinner or snack. This recipe is a make-againer. OMG and simultaneously, DUH - thanks for catching that error - we live just up 495 from RI - guess my geography is worse than I thought!! This looks delish ~ and you say it's easy too? I will have to try it, since you won't be making it for me (I didn't know the country :( I agree totally about US education re: other parts of the world. I learned the same way - listen/memorize/test/forget. When I see how much you and your readers could learn about world geography, I would not throw you the stone for the mistake !!! Take care.